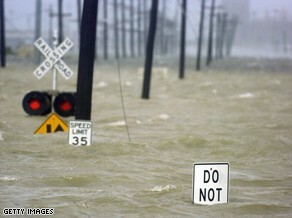 Water from the Industrial Canal floods a road in New Orleans after Hurricane Gustav made landfall Monday. Image courtesy Getty Images. A weakend Hurricane Gustav came ashore Monday morning shutting down power and swamping much of the Gulf Coast with torrential rain. Initially making landfall as a category 2 storm, by 3:00pm MDT the storm had lost much of its power and was downgraded to a category 1 system with winds of 80 mph. Much of the Louisiana and Mississippi coast lines were subject to extensive rains and high storm surge. Winds pushed the water over many levees but the Army Corps of Engineers reported no major problems. The largest provider of electric power in Louisiana, Entergy, said more than 700,000 homes and businesses were without power in the region. The Federal Emergency Management Agency (FEMA) reported two Navy boats, each about 350 feet long, that were being scrapped at a facility on the canal broke away from their moorings Monday. They are currently pinned against a wharf in the Industrial Canal but there is concern that should they move they could strike some of the canal walls. Much remains to determine the extent of damage from the storm. The center of the storm is currently north of Lafaette, LA and steadily moving north. As it does, it will weaken to a tropical storm tonight. 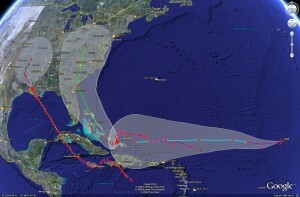 Satellite imagery of the potential tracks of Gustav, Hanna and Ike. Click for larger version. A stark reminder that hurricane season is far from over is the appearance of two additional storms – Hurricane Hanna and Tropical Storm Ike. Both will bear close watching over the coming days. Hanna became a category one hurricane today and as of 3:00pm MDT was just east of Mayaguana Island in the southeastern Bahamas. Hanna is expected to meander for a couple of days before making a turn to the northwest with a possible landing anywhere between southern Florida and the Carolinas late this week. Ike formed out of a tropical depression today and is currently in the middle of the Atlantic, 1400 miles east of the Leeward Islands moving west at 16 mph. A warm ocean along Ike’s path is expected to help it reach hurricane strength in the next 36 hours. It is still very early to tell where Ike will end up but on its current course, it could strike Cuba, the Bahamas and possibly Florida early next week. This entry was posted on Monday, September 1st, 2008 at 3:55pm MDT and is filed under National Weather, Natural Disasters. You can follow any responses to this entry through the RSS 2.0 feed. You can skip to the end and leave a response. Pinging is currently not allowed.